​Damn, they didn't have to do Ben like this, man. 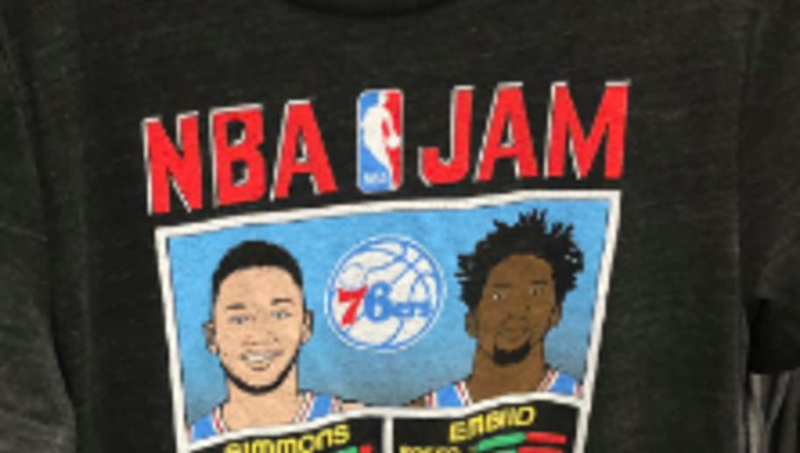 Ahead of the ​NBA All-Star game, the league released NBA Jam-style t-shirts with the ratings of the team's two best players. No doubt the shirts are awesome for anybody old enough to remember the classic video game, but fans probably got a good laugh when they saw the Philadelphia 76ers version of the tee. If you look closely at ​Ben Simmons' ratings, you might notice that bar next to "3 PTRS"
The 6-10 star point guard has been mocked by many for his shooting ability/unwillingness to shoot so far in his brief NBA career. Simmons gets most of his buckets off of layups and dunks, but has added a little bit of a turnaround jumper to his game in year two. Threes, however, remain virtually nonexistent in his game, and the sport is obviously now dominated by the three-point ball. Simmons will obviously need to improve his jumper for the guard to realize his true potential. He is a great passer for his size and has remarkable driving and defensive ability. Adding a jumper would make Simmons an absolute terror to deal with on both sides of the ball.